Hoping to entice those who want bacon, ham, and sausage all together in one breakfast sandwich, Dunkin' launches the new All You Can Meat Breakfast Sandwich. 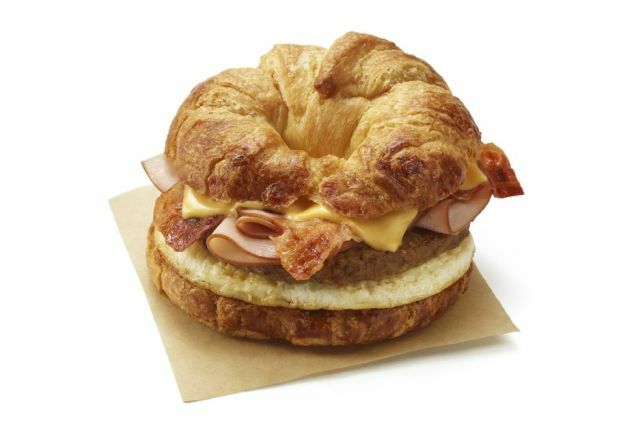 Available for a limited time at participating locations nationwide, the new sandwich features two strips of bacon, two slices of ham, one sausage patty, egg, and American cheese on a toasted croissant. Dunkin' also reveals a couple of deals for this fall. There's a promotion where you can get two Bacon, Egg, and Cheese breakfast sandwiches for $5 at participating locations through December 30, 2018. They're also running a special through November 18, 2018, where you can get any-sized iced coffee for $2 between 2 PM and 6 PM at participating locations nationwide.